Ever since I was little, I have been fascinated with vintage styles. I grew up watching old movies and musicals and I wanted to wear the fancy dresses as well. One of my favorite outfits was when my father did an art deco shoot for his business photos, which I got to be in, and I was dressed in 1920’s attire and the only one allowed to sit in the vintage Rolls Royce. Ever since that moment at 12 years old, I have been 1920’s obsessed. 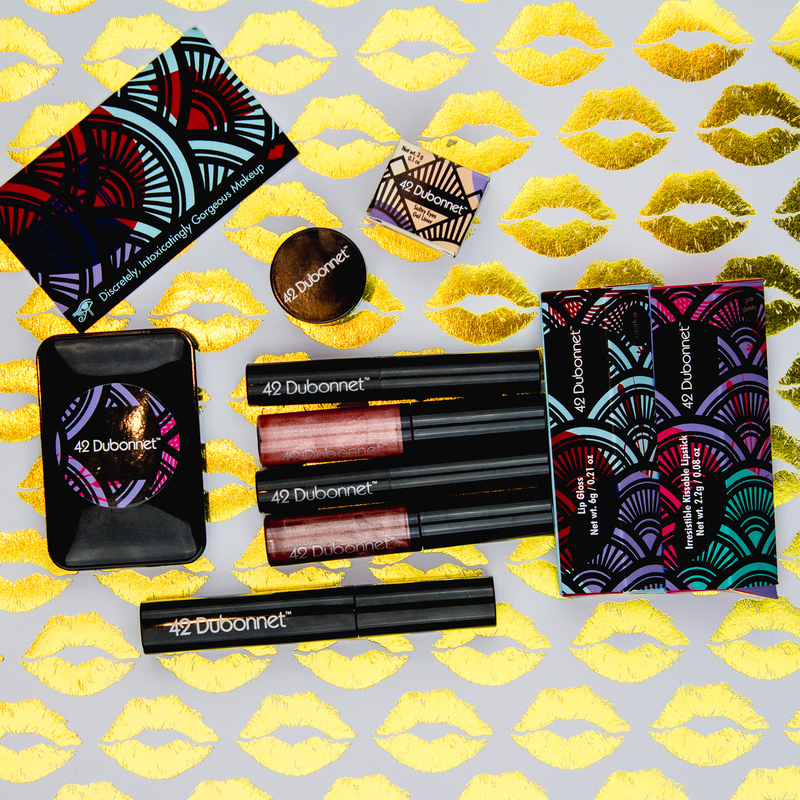 So, when I discovered 42 Dubonnet at the Orlando Makeup Show, I was absolutely delighted and knew I needed these products in my collection!! Here is a photo from my 27th birthday, which was a 1920’s themed party. 42 Dubonnet, is a mother-daughter company. They strive to bring the allure, mystery, and electricity of the 1920’s Art Deco period to our modern time. They are based out of Miami, which still has an Art Deco presence, so are a local Florida company. I am all about supporting our local business owners. I love the discreet, yet beautiful packaging of the makeup which represents the speakeasy era of the 1920’s. The 1920’s woman was the first to put on a full artificial face with the use of powders, eye kohls, mascara, and lipstick. This was the time of the flapper where women could be more bold and daring, especially when they would go out at night. Women wanted to assert their feminine power and makeup companies began to create items that all flappers needed to carry in their purses. This way they could open up their handbag and easily go from a daytime look to evening glam. Look at the compact packaging of these items. With these in your purse, you could easily do a complete makeup look. Use the code: NIKKI to get 20% off your purchases. I paired this makeup look with a gorgeous beaded flapper style dress that I purchased at Nordstrom. This was my bridesmaid dress for my best friend’s wedding, who also loves 1920’s and vintage style. I think this is a great look to wear for a spring tea party, a derby party, or even for a fancy date night. These shoes are Colin Stuart and are from back when Victoria Secret used to sell all types of shoes. I thought they were very Art Deco looking. I also have a giveaway for you beauty lovers!!! 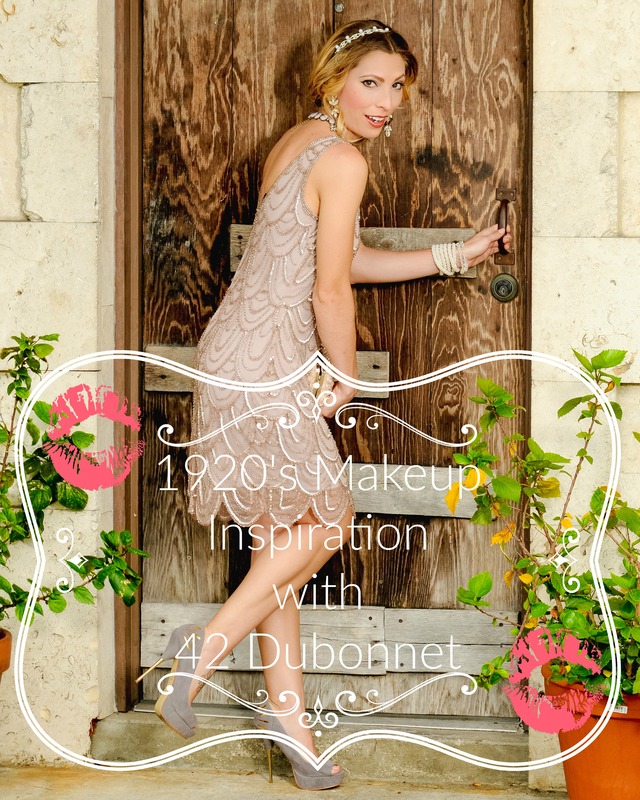 42 Dubonnet has sent their Fringe Noir Mascara for one lucky winner!! This mascara, like the rest of 42 Dubonnet’s products, is PETA certified. 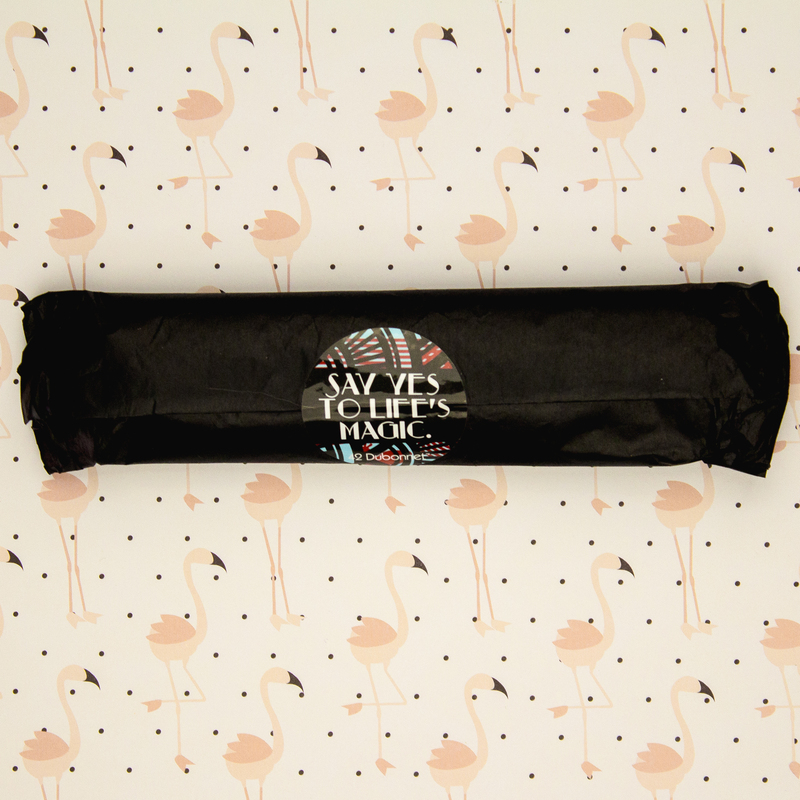 They also donate 1% of all sales to support the animals of the Everglades, which includes my favorite flamingos. You can enter in the giveaway HERE! *Photography by Gil Sturgis of Bodyscape Photography. This post is a collaboration with 42 Dubonnet. They gifted me with products to review, but all opinions are my own. Great photos and look amazing. Beautiful dress, hair, shoes- the whole ensemble. That dress is amazing! 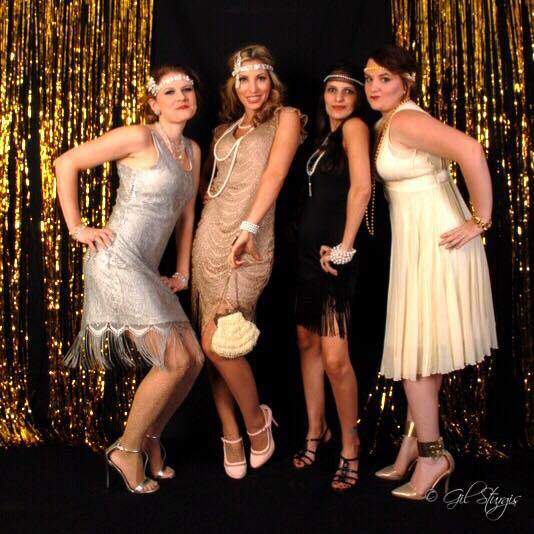 I organized a Great Gatsby themed auction a few years ago and also found a flapper-esque dress at Nordstrom! Your makeup looks flawless! Oh I love love this look! I love the vintage style dress and this is totally something I would have worn to the office! I LOVE that dress and those heels! That dress and shoes are really amazing and together you have some look. I will look for 42 Dubonnet and see if they have products that will look as good on me. You look amazing! I love that you look classy but still have a more natural look. You look STUNNING!!! I love everything about this look. The dress is beautiful! I love the champagne color and I love the vintage look! Stunning! I love the dress and vintage style. The make up definitely completes the look. I need to find a party to get dressed up for. Your style here throws me back to the 20’s and I love it. I adore that necklace you have on. you look so great! I have always loved the 1920’s flapper style, it is just so classic but fun at the same tie! The make up and gorgeous dress are just stunning. Absolutely stunning. Beautiful! I also grew up with an older sense of style. My parents were a lot older than most, and so I was exposed to a completely different era than my friends were. You look lovely! What a fun dress to get to wear as a bridesmaid dress! Love your shoes too. The Art Deco style is one of my favorites so I know I would love that shop! That dress is gorgeous! I love vintage style, I think the 20s through around the 40s had the absolute best fashion of the last 100 years. 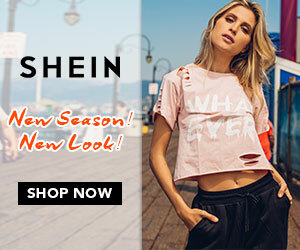 What a fun outfit! Every summer there is a weekend 20s Jazz Festival on an island next to Manhattan called Governor’s Island. 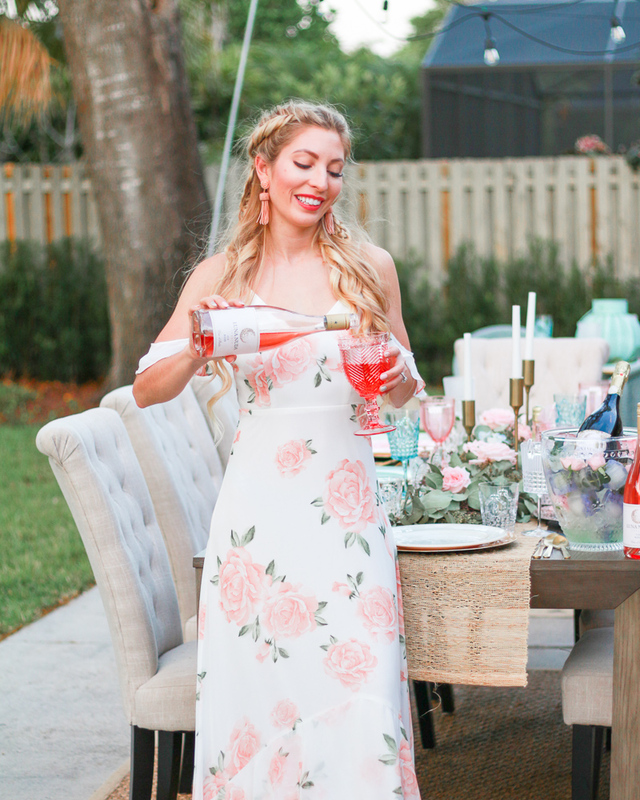 I’m always looking for fun dresses like this one to wear to it. Your makeup looks great, what a wonderful tutorial. There’s nothing more classy and sophisticated than vintage. I love how you dressed for the theme! Your make-up is spot on as well. You look gorgeous! I love that dress and those shoes. Makeup looks fantastic! This dress you have is so gorgeous! I love vintage style, I will have to check this out! This dress is gorgeous! It is classic and perfect vintage. I love the jewelry too. I have always loved the glamour of 1920’s fashion! This dress and those shoes are absolutely stunning! Love the tutorial too! This was such a fabulous photoshoot, you look absolutely gorgeous! Wow, you look stunning! That beaded flapper style dress is really lovely. Great combination with the accessories too! I love your outfit, especially the accessories–they complete the outfit and it really does look vintage! I love vintage home decor so when I learned the story about Sonia (#nastygal) I grew an even bigger appreciation for vintage fashion.